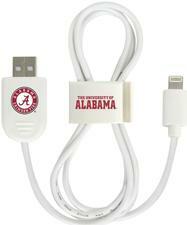 NCAA QuikVolt Lightning USB Cable w/ QuikClip - $22.99 - GolfersEdgeOnline.com - Best Golf Equipment On The Web! Keep your phone or tablet charged with the QuikVolt Lightning USB charging cable! The QuikClip cable organizer provides easy tangle free storage! If you have any more questions about the NCAA QuikVolt Lightning USB Cable w/ QuikClip; do not see the model you are looking for; need custom options; or prefer to not purchase online, then please call us at (630) 656-1291.